ISL Wind is a bespoke renewables innovations company, with a wealth of experience in many fields. More recently in the past few years it has been developing a revolutionary product for the wind industry. The wind project started life in 2005 with its founding member Mr A Rowell. He has a communications and energy background working on optical fibre communications throughout Europe. After working in the optical fibre industry, one of his contracts was to install and test optical fibres on a wind farm in Northern Ireland. After a brief discussion Mr Rowell decided that they would like to get into the wind industry and ideas started flowing. After a few long years of thought and design ideas the concept was born, a cleaning, inspection and repair pod specifically for servicing wind turbines. Ironically, the first demonstration of their invention was on the wind farm that he had installed the optical fibres on, this was pure coincidence. The objective of ISL Wind is to sell its products, which include a full range of services by utilising its invention to compliment the Wind Turbine market. Services for sale include the inspection, cleaning, analysis, repair, X-Ray (tower welds) and ongoing general maintenance of Wind Turbines and their blades in-situ across Europe, USA, South America, Canada & Asia. With over 369 GW of operational wind turbine power in the world (as at end 2014 GWEC) alone, we think that there is an ideal opportunity to expand on our service sales allowing ISL Wind to grow in an ever growing sector of the renewable energy market. The lifespan of a wind turbine blade is considered to be 15/20 years, we believe that with the right maintenance program, the blades proposed lifespan can be achieved and surpassed therefore avoiding any unnecessary capital expenditure. 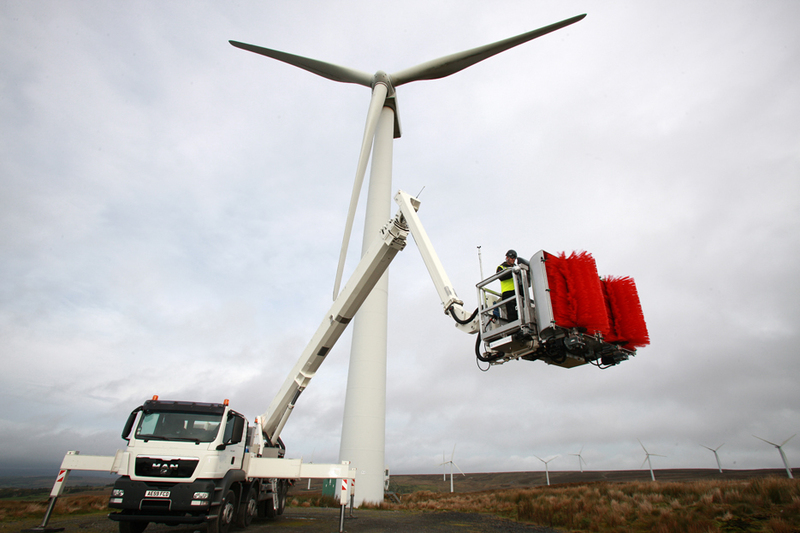 The ISL Wind Service Platform (ISL1) enables us to inspect with the combined use of still images (input into a live report for clients), clean and polish the wind turbine blades and with the use of specialised non destructive testing equipment (when required) test and analyse areas of the blade which may be in need of repair. The repair if necessary will then be carried out from the service platform/pod. The cleaning and polishing of blades can improve the power output of a wind turbines and improve the condition of the blades external surface. A planned maintenance schedule to include the cleaning, polishing, scanning and testing will help prolong the lifetime of wind turbine blades, which in turn increases operational efficiency and the continued generation of power. The global market of installed wind power has risen again through 2014. The USA, South America, China, Canada and India are our main targets for sales, beginning with the USA and South America and then the rest of the world. The worldwide total number of GW's is in excess of 369 GW and the total number of GW’s installed in the USA alone is in excess of 65,500 mw's. In total there are over 1200 major wind farms in the USA, with over 65 GW of installed wind turbines to service and maintain. This is just one country’s example.